HOUSTON, March 10, 2017 /PRNewswire/ -- For the second consecutive year, LyondellBasell (NYSE: LYB), one of the world's largest plastics, chemical and refining companies, has been honored by Junior Achievement USA® (JA) with the U.S. President's Volunteer Service Award. The Bronze Award recognized the approximately 200 LyondellBasell employees from across the country who donated more than 5,000 volunteer hours to Junior Achievement in the 2015-2016 school year. The company also donated a total of $104,000 to the organization last year. Aaron Miner, operations manager of LyondellBasell's Morris, Illinois, Complex, accepted the award on behalf of the company at a special event in New York. Miner participated in JA programs as a young student. Today, he serves as a JA mentor and member of the Junior Achievement of Chicago board of directors. "Aaron Miner exemplifies the power of Junior Achievement. As a former Junior Achievement participant, Aaron received the knowledge and skills needed to plan for the future, and now he is a leader at LyondellBasell and in his community," said Bob Patel, LyondellBasell's CEO and Junior Achievement of Southeast Texas board member. "Part of our company's mission is to be a good neighbor in the communities where we operate. Our partnership with Junior Achievement provides the opportunity for our employees around the country to make a meaningful contribution that has the potential to change a student's life for the better." President George W. Bush established the President's Council on Service and Civic Participation (the Council) in 2003 to recognize the valuable contributions volunteers make in communities and to encourage more people to serve. The Council created the President's Volunteer Service Award program as a way to thank and honor Americans who, by their demonstrated commitment and example, inspire others to engage in volunteer service. 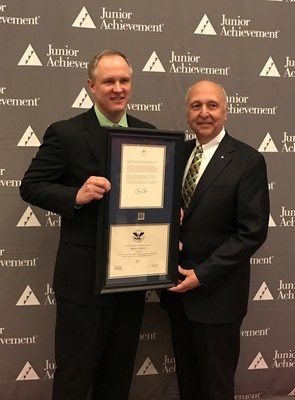 In 2006, Junior Achievement became an official certifying organization for this award, which recognizes corporations with a U.S. presence that provide volunteers to teach JA programs anywhere in the world. "LyondellBasell is an incredible company in so many regards," said Richard Franke, President of Junior Achievement of Southeast Texas. "Their generosity and employees have engaged the JA mission by actively empowering young people to own their economic success. Their volunteers are invaluable mentors for our young people. Individually, each volunteer is bringing life to our programs by sharing their experiences and skills with students. From managing personal finances to identifying and securing a rewarding job, LyondellBasell volunteers are educating and inspiring students with the tools they need to be successful." LyondellBasell (NYSE: LYB) is one of the world's largest plastics, chemical and refining companies and a member of the S&P 500. LyondellBasell products and technologies are used to make items that improve the quality of life for people around the world including packaging, electronics, automotive parts, home furnishings, construction materials and biofuels. More information about LyondellBasell can be found at www.lyb.com. Junior Achievement is the world's largest organization dedicated to giving young people the knowledge and skills they need to own their economic success, plan for their future, and make smart academic and economic choices. JA programs are delivered by corporate and community volunteers, and provide relevant, hands-on experiences that give students from kindergarten through high school knowledge and skills in financial literacy, work readiness, and entrepreneurship. Today, JA reaches 4.8 million students per year in more than 100 markets across the United States, with an additional 5.6 million students served by operations over 100 other countries worldwide. Visit www.ja.org for more information.